Worrying is part of motherhood, but our moms reveal areas you can relax and relieve some stress! As a new mom, it seems like every aspect of your child’s development and your parenting skills is cause for concern. Should I pick her up? Why won’t he sleep through the night? 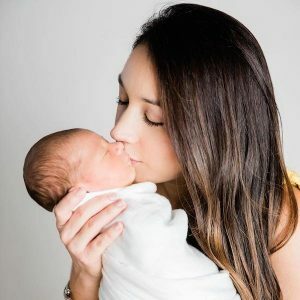 And those internal questions are just the beginning: endless articles bring new worries and concerns to our attention daily, and the unsolicited advice of well-meaning friends and family (and even strangers) is enough to send a new parent into a panic! So, think of today’s edition of “Ask a Real Mom” as a “deep breath” in the midst of those heart-palpitation inducing conversations and articles. Our moms are here to let you in on a little secret: there’s a lot less to worry about than you think! Read on for our mom’s advice on what they wish they had never stressed about. I hope you’ll avoid some unnecessary worry after reading their words of wisdom! While some parents swear by a strict schedule, others are more comfortable going with the flow in the early days. Whether you choose to follow a schedule or not, don’t stress about your choice! Personally, a schedule worked best for my personality and family dynamic, but if it’s causing you stress, let it go and try feeding on demand! With my first, I was so hung up on following a feeding schedule… I really didn’t get on-demand feeding. It made the first night miserable (I legit did not get why she was always crying). 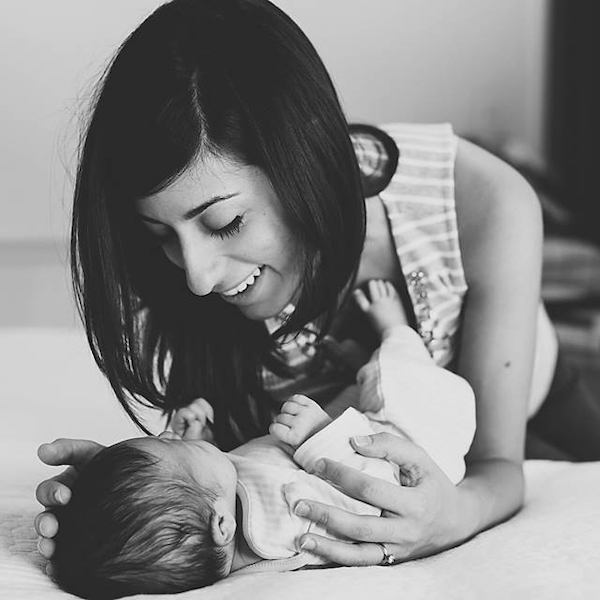 With Eleanor [my second], life was so much less stressful from day 1 just by feeding on demand. -Kathleen H.
If you choose to go with a schedule, be confident in your decision. I was super strict with a sleep schedule with both girls and I copped a lot of negative comments from my elders; however, I would do the same if we had a 3rd! My kids are amazing sleepers and have been from 10 weeks. So don’t stress over what other people’s opinions are. -Marlena C.
Everyone will warn you not to foster “bad habits” like pacifiers, rocking, and on and on…but sometimes, all you need is a good night’s sleep! Bad habits aren’t THAT hard to break. In the beginning, be ok with survival mode. (co sleeping, using a pacifier, using white noise machine, whatever else you are worried might ‘spoil’ baby can all be dealt with a little later). -Kathleen H.
I fought my first daughter’s tendency to fall asleep after a feeding because the books had told me it should be eat, play, sleep – but my other 2 did just fine on a play-eat-sleep schedule! I think I learned too that every baby is just so different – and it’s not necessarily what you as the mom are or aren’t doing. 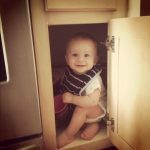 -Bethany D.
They call it “liquid gold” for a reason, and many moms guard their stash in the deep freezer like Fort Knox. But don’t stress if that frozen supply runs low! I stressed about not having enough breast milk frozen for Maverick at 12 months and I ended up having like a week’s worth of milk frozen…I was so stingy with using the frozen milk before that. But I think now when we have another baby I won’t worry so much about having a stash and just let it be. If I run out, I run out! 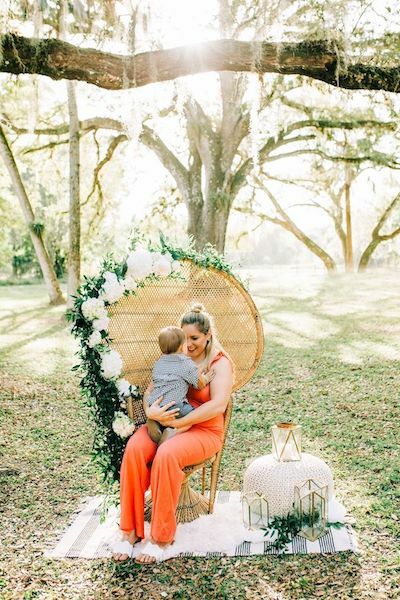 -Caroline H.
And while breast milk might be the “gold standard,” our moms all agree: a calm and happy mom is what’s best for baby! Formula is a modern miracle, and you shouldn’t stress about giving it to your baby if that’s what’s best for you and your family! Definitely formula! I am not a good breastfeeder (apparently) and really struggled to give it up with my first child. Feeling so guilty, etc. He is now almost 3 and he grew and thrived on his year of formula! I tell new moms that it’s just not worth stressing over nursing if it doesn’t work out for them. -Lauren S.
This time last year, when Chloe was 3 months old, I was *crying*, yes, literally crying over having to give Chloe formula because my milk ran out. I’m glad I got over it because Charlotte eats way more than Chloe ever did, and we’ve already had to supplement with formula at 6 weeks. I saw formula as a personal failure. I wasn’t able to provide my child with the best food possible. I soon realized what a gift formula is. As moms, I think we take responsibility for everything in our family’s lives, so if things aren’t ideal and perfect, we blame ourselves and count it as a personal failure. Trying to let go of this feeling still. -Rachel B. 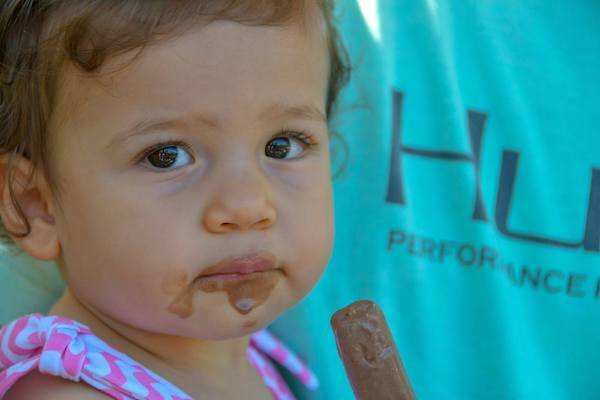 My second daughter, Kate, enjoying a popsicle at her first birthday party. Clearly, this picture shows that I did not worry about sugar consumption as much with our second child as I did with the first! With all the dietary trends and warnings bombarding us via our newsfeeds, it’s easy to start viewing food as the enemy. 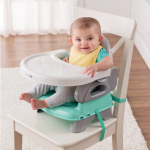 But transitioning our little ones to solids doesn’t have to be stressful! Our real moms agree that balance is key. With Ethan we set out to be so extreme [about his diet]-with the best of intentions- but quickly learned that we needed to release some control. I think it’s wise to do your research and set boundaries but understand that balance is ok and you’ll need to give both yourself and your kids lots of grace. Sometimes you go to Chick Fil A twice in one week and sometimes you have 3 episodes of Bubble Guppies downloaded on your phone. Some seasons/days are more surviving rather than thriving. That’s just the reality of this parenting gig- a refining thing for everyone involved. -Ashley R.
With my first I was concerned about sugar consumption and eating the “right” foods…everything was either homemade baby food or super organic store bought. 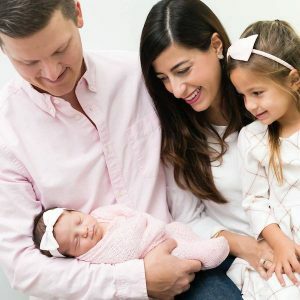 With my second little one, I didn’t put the pressure on myself to make everything and focused on what was best for her and our family dynamics. 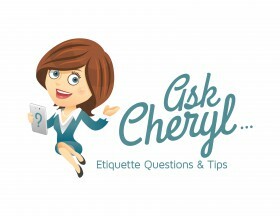 -Alyson R.
What I would stress less about is the mum guilt. Like NEEDING time out and actually asking for it. I didn’t do that much with the first child as the guilt was overwhelming… but talking to my husband about how I was feeling and what I needed really helped, and when he can see I’m about to [lose it], he takes the reigns no questions asked. I think it’s super important for us mums to not lose our identity and to have some time for things we enjoy, or just a little escape for our sanity – whether it’s walking through the aisles alone at Target, taking a class, going to gym, meeting up with friends, or just reading in peace and quiet. -Marlena C.
I saved my favorite piece of advice for last: don’t stress about “having it all together.” No one does! And those things that seem less than perfect, when viewed from a different perspective, are actually opportunities to be grateful. 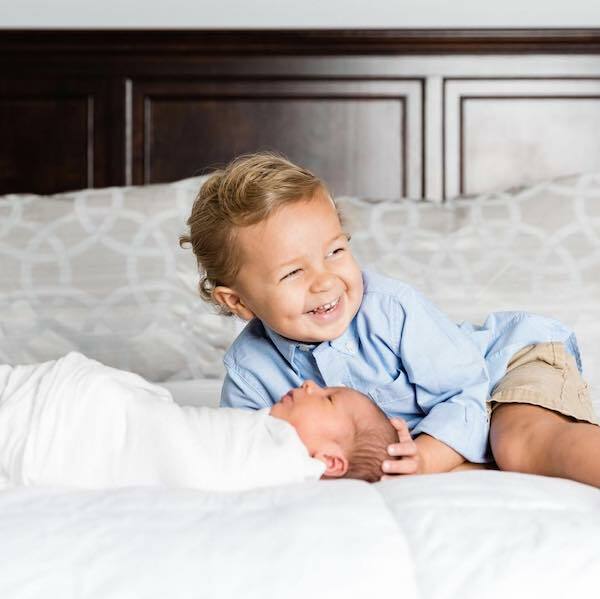 I think as first time moms we have an ambition to prove it to ourselves that we really do have it all together: house is still perfectly clean, body back to normal, kids listen the first time when told. I was so strict on routine and schedule, wanting to do things perfect, that many times I missed the sweetness of the moment. The truth is a messy house means there are kids to mess it up. A less than perfect body means I’ve been blessed to have children. And a child who needs reminder after reminder means I have the opportunity to love on and train them more. -Rebeca A.
I hope you feel a little calmer now that you’ve learned what our Real Moms wish they had never stressed about! Our group of moms is here to answer your questions about parenting, so let us know if you’ve got a topic we can tackle next month! –Written by Christina Peterson, who often turns to her mom friends for advice on everything from products to potty training!